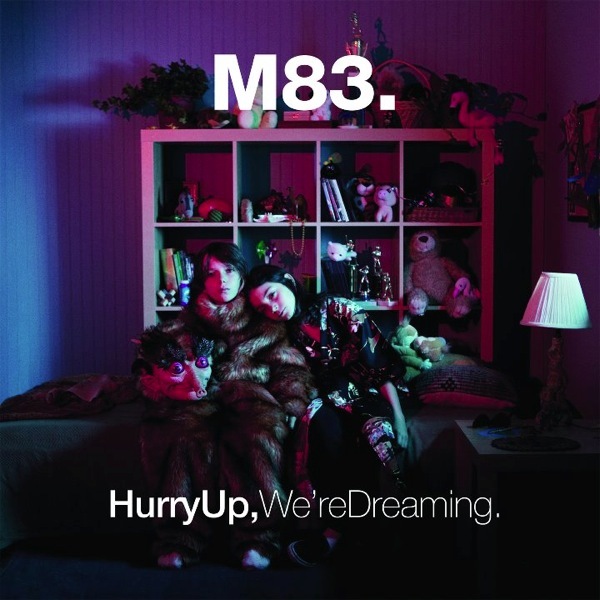 If the stars- no pun intended- were to ever align themselves for a transcendently breakthrough album, M83’s Hurry Up, We’re Dreaming is that album. The double-disc followup to 2008’s critically lauded Saturdays=Youth, Dreaming promised to not only match- but surpass all prior offerings in size, ambition, vision, sound, and kitchen sink excess. Never one to dwell in textured subtlety, Anthony Gonzalez, the mastermind behind M83, has always favored a full-bodied embrace of all that is grand and cosmic- often lending the listening experience wondrous perspective through this unabashed approach. The latest album takes no exception to that trend- in fact, it boldly underlines this tendency as often as it can. Distinctly cinematic in scope and ambition, Gonzalez wears all influences and reinventions proudly on his sleeve- the closest thing the music industry has to their own Tarantino. So, is Hurry Up, We’re Dreaming the greatest album ever, as the promos and buzz seemed to suggest? Well, of course not. Honestly, it may not even the best M83 release. The pacing ebbs and flows; even at seventy-two minutes, it doesn’t quite feel as massive as it wants to be. The whole affair could probably have been condensed into a tighter, single disk. 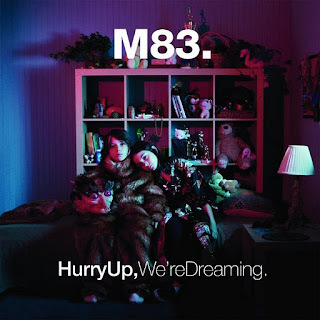 However, minor quibbles aside, M83 radiates a newfound confidence with Hurry Up, We’re Dreaming and it remains one of the more devoutly committed albums you may ever hear. When it does connect, it connects meaningfully and direct. An overwhelming array of epic power ballads and otherworldly ambient bridges, Gonzalez is working overtime here to keep Dreaming relentlessly alive. For the most part, he’s successful- crafting an experience both intimately accessible and polarizing to the point of occasional insanity. Any divisiveness can be attributed to M83’s decision to gradually move away from the sparse, avant-garde noises that initially defined its sound. The deliciously numbing repetition of earlier, more electronic works, such as Dead Cities, Red Seas, and Lost Ghosts, has been all but abandoned in favor of throbbing synth-pop. If Saturdays=Youth wasn’t your cup of tea, Hurry Up, We’re Dreaming allows the listener even less negotiating room by effectively doubling down on the style of it’s predecessor. Look no further than “Midnight City” for evidence of this. A brilliant slice of urban nostalgia, “City” is the pulsating evolution of Saturdays’ “Kim and Jessie”. For fans of this sound, Dreaming features several tunes in the same Peter Gabriel-esque vein (“Reunion”, “Claudia”, “New Map”, “OK Pal”, the explosively ethereal "Steve McQueen"). Each track would feel right at home playing over the end credits of a Reagan-era, John Hughes film. As per usual, M83 delivers a collection of almost-typically beautiful ambient interludes that bridge the gap between these more traditional pop tunes. Perhaps a result of the aforementioned confidence, Gonzalez’ voice is also on more prominent display than ever before, most notably on the acoustic slow burners “Wait” and “Soon My Friend”. And if a central flaw must be found, perhaps in an excessive desire for inclusion, some of the tracks (“This Bright Flash”, “My Tears Are Becoming a Sea”, “Klaus I Love You”) seem a tad truncated as if their scope was not allowed enough room to breathe- frankly, an odd quibble considering M83’s endearing penchant for overindulgence in regards to song length. For an album as profoundly epic as Hurry Up, We’re Dreaming obviously strives to be, it also feels a little measured and familiar- sometimes coming off as too workmanlike in its desire to blow the mind of the listener. Nevertheless, this is the burden M83 must bear for so frequently wanting to shoot us into the nether-regions of the galaxy. When the rocket occasionally fizzles, it becomes more noticeable. The fact that Dreaming so often succeeds in this lofty goal is a profound testament to the effectiveness of M83 itself. While one could argue that each of his releases is a pinnacle in their own right, the quintessential M83 masterpiece is probably yet to come. If Gonzalez truly is the closest thing the music industry has to a Tarantino, Dreaming is less Inglourious Basterds and more the sumptuously alive Kill Bill double-feature- a fantastic placeholder that inevitably leads to an artistic vision where ambition and grasp ceremoniously collide. For now, we must settle for the comfortably amazing and often magnificent Hurry Up, We’re Dreaming. It’s an exciting place to be.